Indian jewellery tradition is unique and the jewellery worn by a Gold n Cart Indian bride is a mirror image of her heritage and the land she hails from. 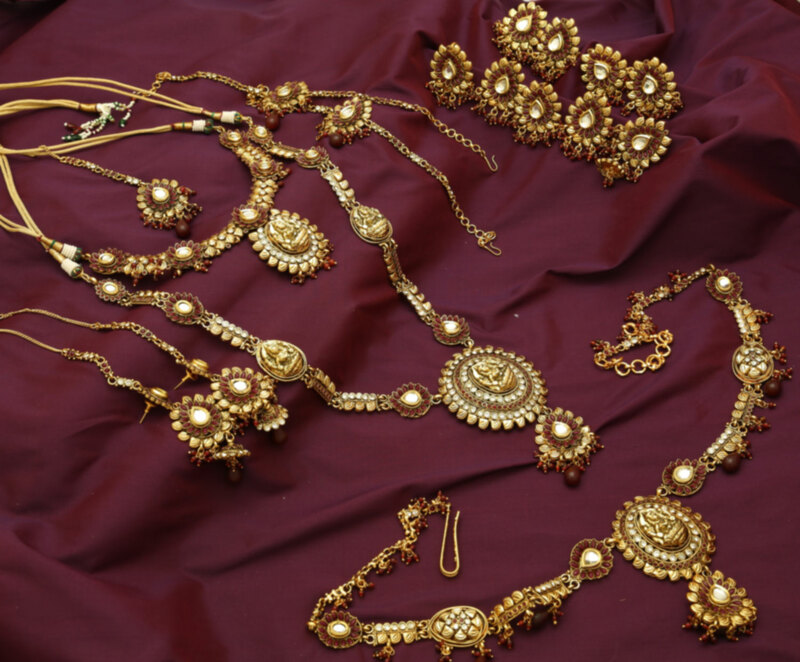 Manimuthu maala, kurumulaku maala, and kingini maala are some of the distinctive necklace designs of the tradition. At the same time, the community is always ready to experiment with jewellery designs from all over the world. Gold n Cart Indian weddings are a mix of traditional and contemporary customs, a combination which is portrayed even in their jewellery designs. Jhumka - Traditionally designed earrings, made completely out of gold. Haram - This one is a brilliant neckpiece, renowned for brilliant craftsmanship and intricate design. Mangalsuthra - Pendant worn on a gold thread by the Indian bride. Kasumala - Necklace with fine gold work on it, composed mostly of gold. Necklace - This stunning necklace features a heavy pendant and is the highlight of the wedding ensemble. Bangles - Indian brides are known for their diverse collection of bangles - Kada Bangle, Patly Bangle, Kurumulaku Bangle, Toe ring, Kolkata Bangle, Hollow Machine cut Bangle, Thin Bangle. CZ Spring Ring - This is a gemstone studded ring, designed in the form of a spring, an extremely artistic jewel. Please upload your Designs in JPG,PNG,PDF format.